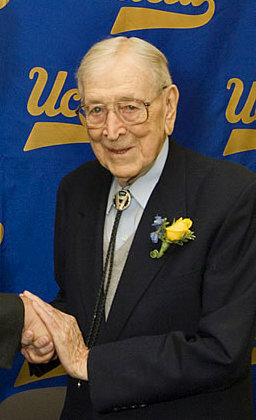 John Robert Wooden (October 14, 1910 – June 4, 2010) was an American basketball player and head coach at the University of California at Los Angeles. 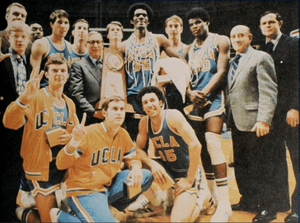 Nicknamed the "Wizard of Westwood," he won ten NCAA national championships in a 12-year period as head coach at UCLA, including a record seven in a row. No other team has won more than four in a row in Division 1 college men's or women's basketball. Within this period, his teams won an NCAA men's basketball record 88 consecutive games. 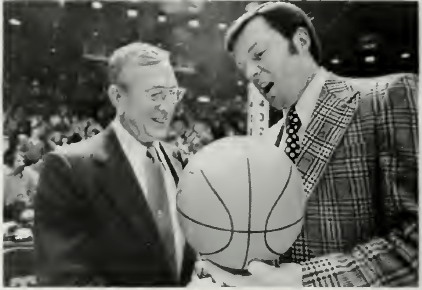 Wooden was named national coach of the year six times. He also won a Helms national championship (which was decided by a poll) at Purdue as a player 1931–1932 for a total of 11 national titles. As a 5'10" guard, Wooden was the first player to be named basketball All-American three times. Wooden was inducted into the Basketball Hall of Fame as a player (1960) and as a coach (1973), the first person ever enshrined in both categories. One of the most respected coaches in the history of sports, Wooden was beloved by his former players. Wooden was renowned for his short, simple inspirational messages to his players, including his "Pyramid of Success." These often were directed at how to be a success in life as well as in basketball. Wooden's 29-year coaching career and overwhelmingly positive critical acclaim have created a legacy of great interest in not only sports, but in business, personal success, and organizational leadership as well. Wooden was born in Hall, Indiana. He studied at Purdue University, he married Nellie Riley in Indianapolis, they were together 1932 until her death in 1985, during this time they had two children. In 1942, he joined the United States Navy during World War II. He served for nearly two years and left the service as a lieutenant. Wooden died on June 4, 2010 in Los Angeles, California from natural causes, aged 99. Wooden was layed to rest with his wife Nellie in an mausoleum at Forest Lawn Memorial Park in the Hollywood Hills neighborhood of Los Angeles. John Wooden Facts for Kids. Kiddle Encyclopedia.